I volunteered as polling agent(am shift) for S'pore Democratic Party(SDP) in the general election held last week. Although i don't support lebian/gay, the policy papers published by SDP is better than the Workers Party which is the preferred alternative party among peasants. Manifesto 2015 of the Workers Party(WP) has improved over its 2011 but i still consider SDP's proposal better than WP's. Another reason i chose to volunteer for the SDP is they are the best hope in the west for winning parliamentary seats. I was the only polling agent(am shift) at the polling station i was assigned to. The hybrid regime has 4 polling agents & they rotated once during my 6 hour shift, hence there's 8 of them. All the hybrid regime polling agents are busy with their work of striking voters name out on their list by referring to the polling coupon number called out by the presiding officer. eg. 001 Tan Ah Kow called --> Strike out 001 from list. Alternative party polling agents don't have the list(required to buy). This is an uneven playing field besides shortage of manpower by alternative parties (1 vs 8). I was dressed in party colors(red shirt & khaki pants) as we're told to do so. The presiding officers who are from the civil service all wore neutral colors. To my surprise the hybrid regime polling agents also wore neutral colors as i read from forum on a thread calling for volunteers that they are all 'white'(previously). Perhaps they themselves are prepared about the reduction in votes for the hybrid regime hence is better to wear neutral colors. The most important task of a polling agent is to arrive early at 7:30am to inspect the ballot boxes to make sure they are empty prior to sealing at 7:50am. Thereafter the work of an alternative party polling agent is akin to an invigilator during exams. Polling agents can listen in to presiding officers explaining voting procedures to their 'blur' people. Nobody is supposed to tell voters who to vote in the polling station. During the slightly more than 6 hours i was there, i didn't go to toilet(emptied before start). Preferably there should be 2 polling agents(alternative party) at a polling station. I had to watch over 4 ballot boxes & luckily all 4 boxes are in straight row. My shift ended when a girl(red shirt) relieved me. At end of my morning shift, around 75% of voters have voted. Went back to my constituency to vote. For the pm shift polling agent, the most important task is that there are no fake boxes on the transport bus. Witness the proper sealing of the box slot. If possible, board & accompany the transport bus to the counting center. Even though Singfirst is the alternative party standing in Clementi, i voted for them anyway. I went to bed early due to sleepiness as i didn't get much sleep in the hours leading polling agent duty. It is to my shock the morning i wake up to learn that practically all the swing voters voted for the hybrid regime. And yet these fencesitters chose to give a strong mandate to the hybrid regime! How daft can they be? I would say the fencesitter voters are daft. They are not thinking logically & not looking at the bigger picture. Why? Those rot & decay i mentioned earlier. Manifestos/policy papers by SDP & WP are better than the hybrid regime's picture book with little details. WP contesting 28 seats out of 89 parliamentary seats. Even if win all, still need another 2 seats to be captured by another party to form 33% alternative voice in parliament. Hence hybrid regime with majority seats would still form the government. ......but even more despicable are those swing voters' blind devotion. Imagine you are a boss/supervisor. Would you want to have daft workers working for you despite all those logically reasons presented to him/her & yet they still chose to be bullied by the vendor/supplier by giving a strong mandate? All these kiasu(scared lose) , kiasi(sacred die) & daft workers who are not thinking logically & not looking at the bigger picture would eventually give you more trouble. The single engine dominated jetliner is performing poorly & the daft passengers still don't want to have an alternative engine as backup. How can you compete if your competitors are hiring & surrounding himself with workers who are better able to think long-term for themselves? Swing voters basically chose the lesser of 2 evils, which is the PAP. Simply because as the opposition is not ready to be govt, swing voters do not want to accidentally vote the PAP out and having AHPETC issues in their Town Council. WP announced they are contesting 28 seats. Even if WP win all & another 2 seats won by another party, there is only 33% alternative voices in parliament. PAP would still be govt. Hence i don't understand what lesser of 2 evils you are referring to. As for AHPETC issues, it has been highlighted in socio-political sites that it is a sabotage by pap. 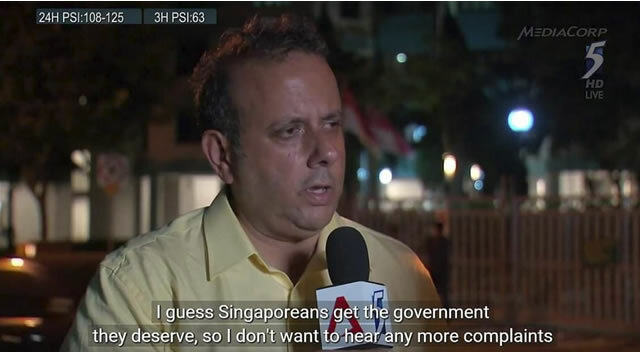 I wouldn't call the Singaporean voters daft, I think they value short-term security greatly (even if in your and my opinions, they are trading-off their long-term stability/resilience). That's the way democracy works -- the wishes/values of the majority trumps. As to why Singaporeans are so kiasi, the following research suggests a plausible contributing factor. A generation of Singaporeans lived through WWII as infants/toddlers.